Thousands of people are demonstrating across Europe on Saturday to urge leaders to make the fight against climate change a priority. Sixty marches were organised across the Old Continent on Saturday with the vast majority taking place in France. People rallied under the "Il est encore temps" (There is still time) hashtag with some highlighting on social media that the day's weather, unusually warm for the season, was proof action is needed. "Today we march for the climate, it's October 13: it's 30 degrees celsius...It all makes sense!," Jerome Masegosa tweeted. Antoine Le Tertre, who took part in the rally in Angers, in north-west France, posted a picture of the procession under a bright, shining sun. "An opportunity to remind that the consequences of climate change are already tangible. We have to urge public powers to intensify their policies to preserve our planet," he posted on Twitter alongside the picture. The rallies come a week after the Intergovernmental Panel on Climate Change (IPCC) — an international body created by the United Nations and the World Meteorological Organization — warned that "rapid, far-reaching and unprecedented changes in all aspects of society" were needed to limit global warming to 1.5 degree celsius above pre-industrial levels. "The report highlights a number of climate change impacts that could be avoided by limiting global warming to 1.5ºC compared to 2ºC, or more. For instance, by 2100, the global sea level rise would be 10 cm lower with global warming of 1.5°C compared with 2°C," the IPCC said in a statement. 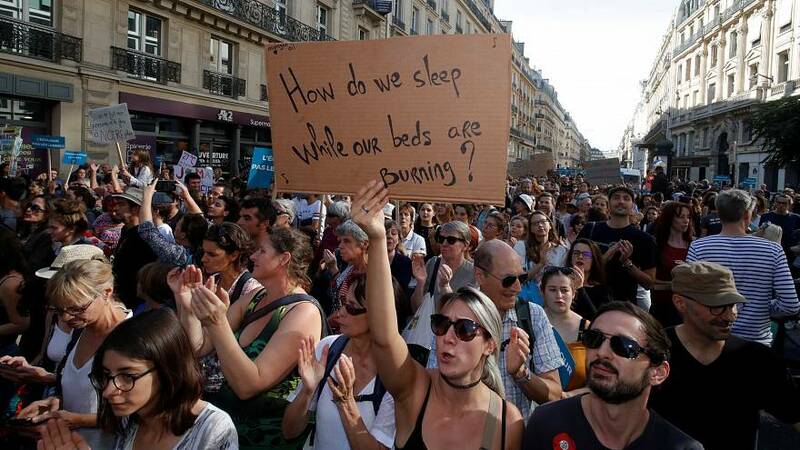 A similar march was organised last month in the French capital after the country's then-ecology minister, Nicolas Hulot, caught the government off-guard by resigning on live radio. The march was then attended by 18,000 to 50,000 people according to police and organisers respectively. Andy Battentier, co-organiser of the march in Paris told Europe 1 radio on Saturday that the mobilisation is a way "to maintain pressure". "Our ultimate aim is that these problems are taken care of, seriously. It's what Nicolas Hulot called for when he resigned. He said that there was a big problem and that he couldn't understand why these things always remained in the background. "How do you want to have politics if there is no environment where humans can live? So it must become the number one question," Battentier added.